Have you been thinking of starting a blog for forever but just can’t ever figure out where to start? Do you day dream about what it would be like to be your own boss? Pick your own working hours? Have the freedom to travel the world if you desire? Would you want to be able to turn blogging into a full time job? If yes, you definitely should start your own blog. I was not tech savvy when I started my blog (still not good on a computer). My lack of computer skills required me to ask my husband how to change the background on my computer (yes, this literally happened). Web development software is now designed for people like me; now a days it makes things a million times easier, and a million times cheaper. Hover over the image to Pin it for later! Thank you so much for sharing! Starting a blog turned out to be one of the best decisions I ever made. To be honest, when I first started I never believed I would have success with it. It was just a way for me to get through one of the most difficult times in my life. When I started my blog I was very sick and had been bedridden for two years! I was miserable. I quickly came down with this life sucking illness that made it hard to get through the day. I wanted to start a blog for a while, but felt I did not have the health or abilities to actually do it. I mean, I couldn’t even sit up!! How was I going to have a successful blog?! After a full year of telling myself I was too sick to start, I decided to stop making excuses and just do it. I think the reason so many people hesitate when starting a blog is because there are so many myths floating around. Some of the biggest myths I encountered are that running a blog is too expensive, maintaining a website requires technical expertise, the blogging industry is too saturated, and it is impossible to make your content stand out. These are all myths!!! These myths can be so discouraging for a new blogger, and prevent many people from even trying. With me being stuck in bed 24 hours a day, I had a ton of time to research (an actual advantage of my illness). There really are a number of great tools out there, but this post will walk you through some of the basics, and recommend products to get you started. Even though I make commission on some of my recommendations, the recommendations in this post are all things I use! Don’t believe what you hear online! You can be successful blogging today. Within 6 months of starting my travel blog, I was getting 170,000 page views a month, and already making money every month! In the next 2 months after that my blog hit over 1 million page views. I honestly couldn’t believe it. Everything I read online said it would take me years to build any sort of following and make money. Most of the bloggers I talked to worked 80 hours a week and posted every day. I knew this type of commitment was not possible for me, so I never thought I would have success. As my first year of blogging ended I reached over 1.3 million people, and that was all while taking long breaks from posting due to my poor health (I went 6 months and only put up 2 posts). Don’t let people discourage you from starting a blog. You CAN be successful, and it is not too late to start. 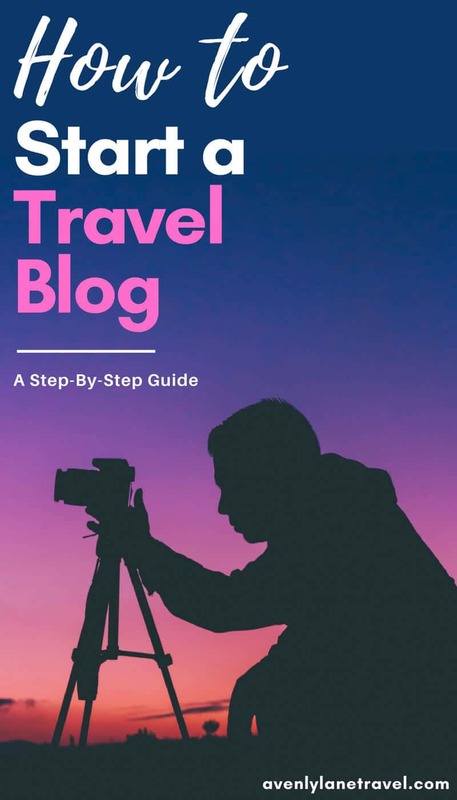 A step by step guide to walk you through how to create your own travel blog. Confused already? Worry not, I had no clue what hosting service to use when I first started out! A hosting service is a company that will actually house and keep your website connected to the web 24 hours a day. They do this by giving you space in one of their servers, and keep those servers permanently plugged in to the web (if you tried to do this at home it would be ridiculously expensive and require a lot of technical know-how). There are a lot of hosting services out there; after A LOT of research and a trusty recommendations, I decided to go with Bluehost for a few reasons. They are very cheap ($3.95/month) and I figured that even if my blog never took off, I wouldn’t be out that much money. It can be terrifying to spend money on something that you are not sure you will stick with. I know the feeling. I have been there! Thankfully Bluehost offers a money back guarantee if you decide to cancel later on. This made me feel so much better about taking that first step. 1. Navigate to Bluehost.com and click the big green “Get Started Now” button. Next you will select your plan. I would start with the $3.95 plan, as you can always upgrade later if needed. Most of the extra features are not needed for a new blog, and when they are needed, it is extremely easy to upgrade. The next step is to register your domain, or to choose your actual website address. For example, www.avenlylanetravel.com is my domain name. Enter you domain name in the “new domain” box and click “next”. **You get a free domain name when signing up with bluehost. Another bonus! If you’ve already registered a domain name, you can enter it on the right. 4. Continue down to the “package information” section. 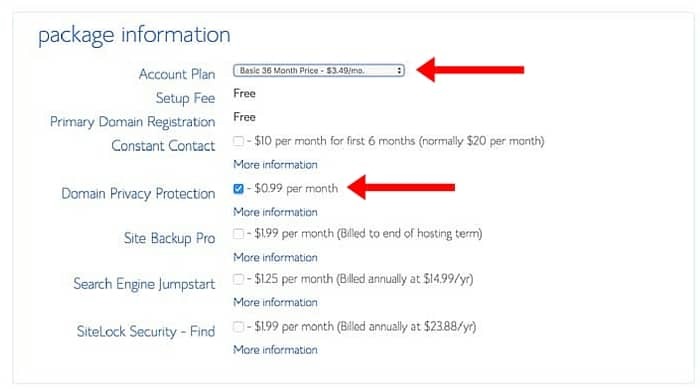 You get the cheapest monthly rate by selecting 36 months, which requires you to pay for 3 years up front. When I signed up, I did not know I would be charged the full 3 years, and was shocked to see the total sum taken out of my account. Don’t let this stress you out or hold you back though. 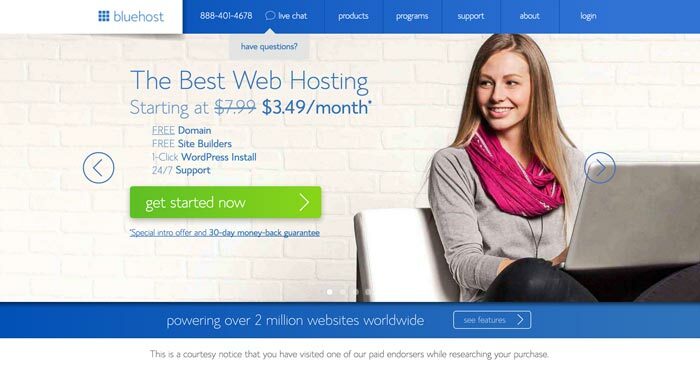 Bluehost has a money back guarantee if you change your mind. You wont be locked into a three year contract! 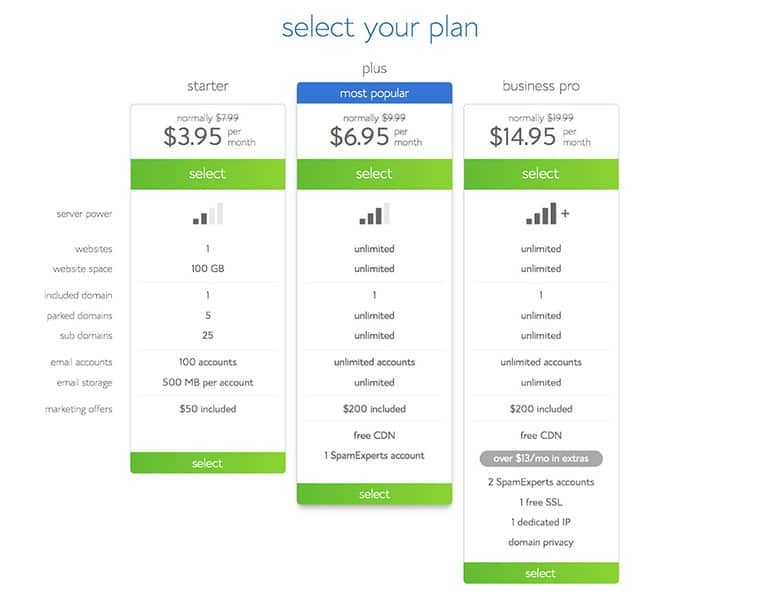 If the upfront cost is too much, you can always consider pre-paying for the 12 month plan instead ($6.95 a month instead of $3.95). It will be a little more expensive month to month but not much. Don’t get caught up in all the extras; they really are not necessary, especially as a beginning blogger. The only one I do recommend is the Domain Privacy Protection. It is only $9.99 for the entire year. 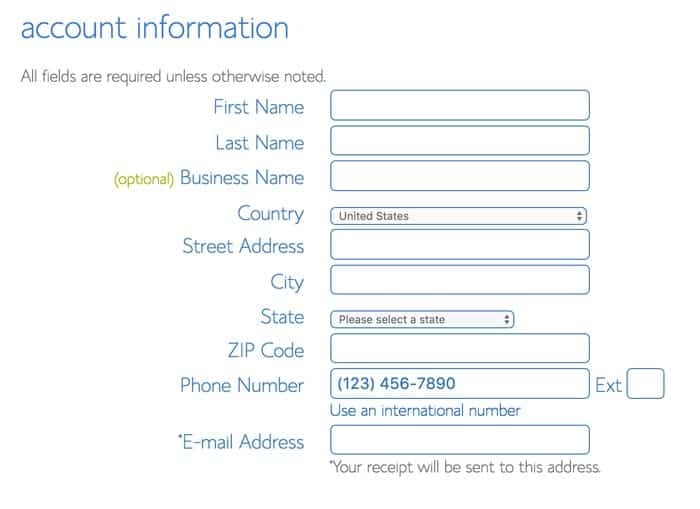 If you don’t add this protection, then people will be able to look up your home address, phone number, etc. via your domain name. Kinda scary! 5. 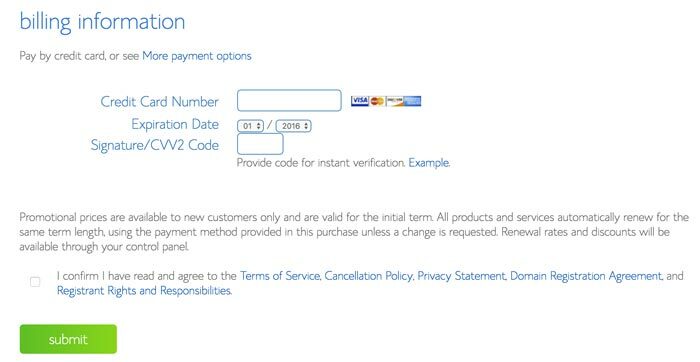 Enter in your billing information, agree to the service agreements, and then click “submit” to move to the next step. 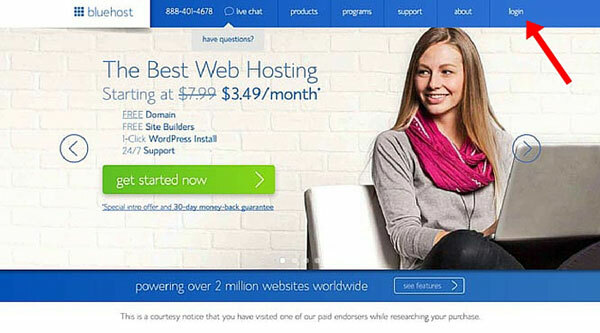 After you have completed your purchase you will be sent a welcome email from Bluehost. This email will contain all your login information, so be sure to keep this email for future reference. You now have domain and hosting for your blog. The next step is to install WordPress. No clue what WordPress is? Once again, do not worry, but be ready for WordPress to become your best friend. Basically, WordPress is the software that makes designing your blog and typing out your posts super quick and intuitive. WordPress makes it so you never need to learn how to code your website, yet can have the benefits of a fully coded website. More than 60 million websites are managed through WordPress, and thankfully it can be installed with one click directly through Bluehost. 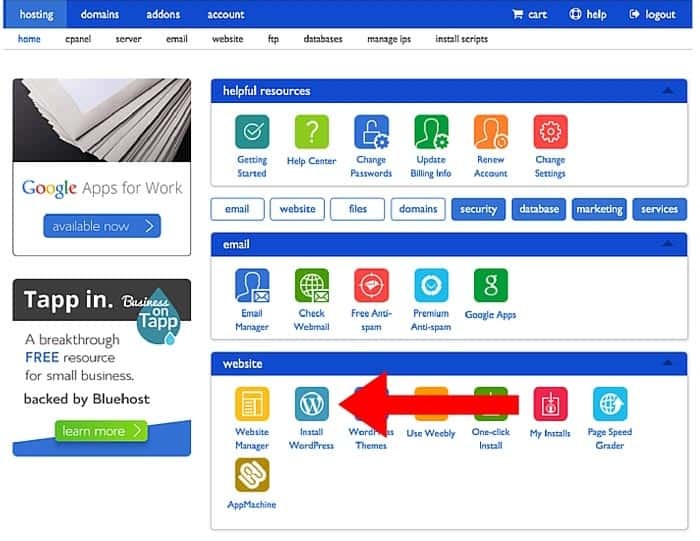 Go back to Bluehost.com and click the Login button in the top right corner of your screen. Continue to log in using your username and password that were emailed to you. 2. Click on Install wordpress. Bluehost has an option to install wordpress with just one click! It makes things so much easier when signing up and you do not have to hire anyone to do this for you. Next you’ll get a window that looks something like this. Click the Install button to begin the WordPress installation process. Choose your domain from the dropdown menu if it’s not already chosen for you. Don’t worry about the directory field. Leave the directory field blank. Click Check Domain. At this point, you officially have your own travel blog. Yay! Next we need to make it look good. A website theme is what determines the actual layout of your site. The theme determines how your posts are displayed, where the actual posts are, where pictures are, where the title goes, every link that is available for people to click on, and what people see when they scroll. WordPress has THOUSANDS for different themes for you to choose from, some are free, and others are paid for. Each theme has tons of options that can be tweaked as well: colors, fonts, number of columns etc. You want to find a theme that you like, but also one that allows you to grow. I purposefully chose a theme with LOTS of design options so that I could “redesign” my site if I got sick of its current look. I’ve already made tons of changes as my blog has developed. Even if you do not like the theme you first choose, themes can always be switched later on. The theme I chose to start is Simplemag by Themeforest. I currently use the theme 15Zine also by Themeforest. This is another amazing theme that I have been super happy with. Either of these themes would be great to start with. No coding required. ThemeForest has so many WordPress themes to choose from and they also offer awesome customer service. I used them non-stop when I was first figuring out how to put my theme together. – ThemeForest is a huge database of premium WordPress themes which I always reference if I’m designing a new site. There are a lot of styles to choose from, so if you’re looking for something with a built-in design right out of the box, this is a good place to start looking (once again remember I’m a girl with no technical computer background or understanding). If you do not want to pay for a theme, (mine was $50) then no worries at all! WordPress has a ton of free ones you can pick from. You can check some of them out here. The last step is to begin writing posts. You will see how incredibly easy it is within WordPress. Simply login to your WordPress account dashboard and click POSTS and then ADD NEW – a typing box immediately pops up and it is ready for your posts. The typing box operates just like write your post, (also easy to add pictures or hyperlinks) . Once you finish writing, you just click post, and your new post is immediately available on the web. Bam! Finished, no coding necessary! It really is that easy, and I cannot recommend this process enough. I wish you the best of luck with your new blog! Oh, and also if you guys are interested to learn more on how I grew my blog you can click the button below to sign up for more tips. As a bonus just for signing up you will also get sent my free “Group Board Cheatsheet”. This will include a list of some of my favorite travel group boards you guys can join that bring me tons of traffic each month. I include board statistics and how I received an invitation to join them. Hope you guys enjoy! If you guys have any specific questions or comments you can ask them below! Hey! Awesome post. I recently just started a travel blog, but I am not getting many views at all! Do you have any suggestions? Hey Shelly! I have SO many suggestions but it is hard to write them all in a comment! Haha. But I would definitely start with Pinterest. I have found Pinterest to be the best tool by far to grow your traffic quickly when you are just starting out. I would make sure you have a Pinterest business account, rich pins installed on your site and make lots of pins for each post. (Vertical, bright colors, with and without text). If you want more tips I have an email that I send out to bloggers looking to grow their travel blogs. You can sign up by clicking the red sign up button at the top of the post. You will also get a free group board cheatsheet that will list 5 of my best performing group boards that I am a part of and how I joined them. If you have more specific questions let me know! Thanks for sharing. I was also sick for few years, but this was back to 2000, din’t have any internet that time. I was acually thinking about i resently. I spent several years in bed in hospitals, and if I had all these possibilities like now, I would have done so much out if it. I know, it’s sll an excuise, but still. That’s not an excuse at all! I seriously can’t imagine getting through these last few years without the internet. Being sick in bed is a brutal life and internet is just one of those things that you can use to entertain yourself while in bed. I am so happy that you have recovered! It gives me hope that one day I will be able to recover and live a “normal” life. As far as blogging tips go the first question I have to ask is do you have a Pinterest account for your blog? Are you creating vertical pins (with text) and putting them on Pinterest linking back to your site? Pinterest brings almost 5,000 views a day to my site so it can make a HUGE difference for you Lena! You can see examples of what I mean by looking at the image at the top of this post. That image is so people can pin my post to Pinterest if that makes sense. I just started up my poetry blog with my domain name, i have been posting some contents on there and would like to ask how more can i acquire much traffic, how can i sell ad spaces and when is it right to apply for google adsense. The SEO plugin is not even popping on my dashboard yet. I would start up with google adsense right away. It won’t hurt anything even if you don’t have enough traffic to make the monthly threshold ($100). When I first started my fashion blog it took me maybe 3 months to reach the payout of $100. But getting that first check was awesome! Haha. 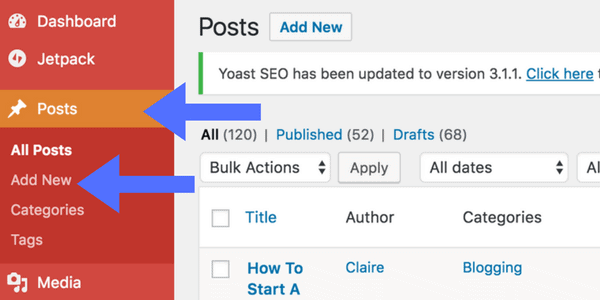 Are you using Yoast SEO? That is the plugin that I use and love for SEO. It should show up at the bottom of the page where you write your posts. You can even youtube how to use it and a ton of videos will come up with instructions. As far as getting traffic I get over 5,000 views a day from Pinterest so I would say def. start there! Open a Pinterest business account for your blog and start creating vertical images with text on them that link back to your site. You can see an example of an image I created for Pinterest at the top of this post. I put at least one of those in each post so people can share the image to Pinterest. Good luck with your blog and feel free to reply again and ask more questions if you have them! Thanks so much for sharing this blogpost..its so inspiring.I think am going to start a fresh new blog. currently have a blog but in partnership with tech savvys. I didn’t know i could do it alone.Am going to create my own new blog.Thank you! thank you! That is so awesome! You definitely should create your own! With wordpress and bluehost and all the pre-coded blog themes anyone can do it today! It can be very rewarding. Clear & detailed instruction. Thanks a lot for sharing. Thank you so much! I am so happy you found it helpful! I’m going to have to take your advise on pinterest. I’m just not getting enough traffic! I travel every weekend, so I post once a week about the trip.. and then the next week its something new. I don’t feel like I’m sharing each post enough. Any tips for planning and scheduling posts, or anything else specific to pinterest? And what is a pinterest business acct? Should I convert my personal , or make a new? Thanks so much! I am so glad you found them helpful. And the answer is YES! Definitely convert your account to a business account. It will give you access to analytics so you can see what pins and boards are your most successful, how many people look at your profile, click through to your website, etc. I would convert your personal if you have a large following already that is related to the topic you blog about. That is what I did. If you want to keep your personal for yourself then no harm in starting new with a brand new blog account. Good luck! Let me know if you have any other questions.